Length (bottom of collar to bottom hem) - 28". We are not happy unless you are! We will properly wrap every item carefully. 100% Cotton. We would be very happy to answer them within 24 hours. CARHARTT Original Fit Short Sleeve T-Shirt Size 2XL XXL Logo 100% Cotton. Condition is Pre-owned. Shipped with USPS First Class Package. This is an dark teal blueish/green color. Measurements in pictures. Carhartt Shorts Men’s Size 33 Tan 100% Cotton. Condition is Pre-owned. Shipped with USPS First Class. The inseam measures 7 inches. There is a W written on the interior fabric. Please see picture. It is not noticeable when the pants are worn. Good condition. No holes or tears. pre owned mens size large This lot includes (1) long sleeve carhartt force shirt & (1) carhartt force pants these are like long johns to wear under your clothes keep you warm and are sweat and smell resistant Lot of 2 Carhartt Force Mens Shirt & Pants Size Large. Condition is Pre-owned. Shipped with USPS Priority Mail. No holes or Stains. SIZE 32 X 30 RN # 14806. Length along back top of collar to bottom 31 1/2”. Armpit to Armpit 27 1/2”. Carhartt Cell Phone Work Shorts Men’s Size 38 B144 Tan. Condition is Excellent Pre-owned. Shoulder Hem to Sleeve Hem: 26". - Neck to Front Hem: 28". - Back Neck to Bottom Hem: 30". Length along back top of collar to bottom 34 1/2”. Bottom leg opening 8 in. rise 10.5 in. Plenty Of Life Left In These Shorts. 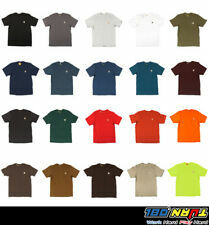 Carhartt K87 T Shirt Lot. All are pre owned is great condition. Lot of 4: Black, Green, Grey, Steel Blue. Carhartt Men Shirt Original Fit Regular Sz 2XL Used Good Condition. Condition is Pre-owned. Shipped with USPS Priority Mail. 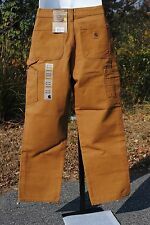 "CARHARTT" Men's (Size 30) Khaki Relaxed Fit Carpenter Style Work Shorts Nice !! Really Nice ! Great Cond. These are 100% cotton, comfortable, classic type, Carpenter/utility pockets, etc. Carhartt Men's Tipton 5-Pocket Denim Jean Shorts 10" Dark Wash Many Sizes NEW! 5 out of 5 stars - Carhartt Men's Tipton 5-Pocket Denim Jean Shorts 10" Dark Wash Many Sizes NEW! 1 product rating1 product ratings - Carhartt Men's Tipton 5-Pocket Denim Jean Shorts 10" Dark Wash Many Sizes NEW! Trending at $20.22eBay determines this price through a machine learned model of the product's sale prices within the last 90 days. The right pieces of clothing can help keep you warm when working outside or engaging in outdoor activities. Carhartt offers a wide range of clothing for men like outerwear, overalls, vests, work pants, jeans, shirts, hats, and thermal underwear. Clothing materials include cotton duck canvas and flannel, and features include details like reinforced pockets and hammer loops. What colors are available for Carhartt men's apparel? Carhartt men’s clothing is available in different shades of brown, black, navy, olive green, and beige, among other colors. Neutral shades can be combined with a variety of other hues for their plaid shirts, too. What styles are available in this line of men's clothing? The Sandstone Sherpa-Lined Mock-Neck Vest is a vest with a chest zip pocket and two inside pockets for storage. The vest is made of cotton duck canvas and lined with sherpa. Its center-front zipper is made of brass. Available colors include frontier brown, dark brown, moss, black, and gravel. The Hubbard Plaid Flannel Shirt is a red, black, and white checked flannel with long sleeves and button cuffs. The shirt has extra room inside and shoulder pleats. It is made entirely of flannel. The Washed Duck Work Pant is made completely of duck canvas, and it comes in eight different neutral shades. Features include utility pockets, a hammer loop, and reinforced back pockets. It has a straight leg opening. What materials are used for this line of men's clothing? Lots of gear designs are made of duck canvas and flannel. Cotton is used in various forms to manufacture Carhartt garments. Jackets, pants, and select shirts feature the duck material. What sizes are available in Carhartt clothes for men? Generally, tops are available in U.S. men’s sizes small through 4XL. Bottoms are available in waist sizes 30 through 44, and inseams come in 30 through 36. Big and tall options are also available in tops and typically range from large through 3X. Some styles may be available in larger or smaller sizes. What is the history behind the Carhartt company? In 1889, the Carhartt family began manufacturing garments with the goal of making clothing for American working men. 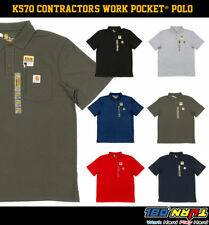 Since then, the company has evolved to make all sorts of different types of work apparel for men. Content provided for informational purposes only. eBay is not affiliated with or endorsed by Carhartt.